There was a guy walking down the street in San Francisco, and he tripped over an old looking oil lamp. He picked it up and hid it under his jacket, because he thought it was priceless. While he was running to the antique shop to cash this puppy in, it rubbed against his shirt. A genie popped out of his pocket! The very angry looking Genie said, "All right, I have had enough with this three wish stuff, and 'cuz you stole me away from my HBO Special, I will only give you one wish!" The surprised man said, "OK, I want to live in Hawaii in a huge condo on the beach with three million dollars in the master bedroom, but I am afraid of boats and planes so I want you to build a bridge from here to Hawaii." The genie replied with a smirk, "Are you crazy? Do you know how long that will take, with the pillars going down to the bottom of the ocean, all the cement it wou ld take for the highway? No I'm sorry, it just can't happen." The man said, "Fine then, I want to understand women." 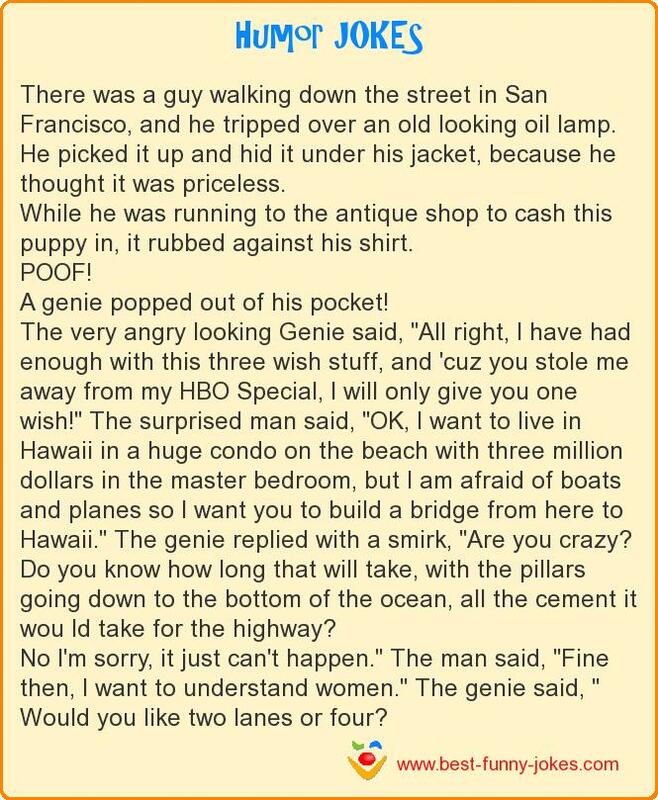 The genie said, " Would you like two lanes or four?